I have been working at the various stages of preparation, concept and execution for the project Satellitstaden in Fittja since May 2011. 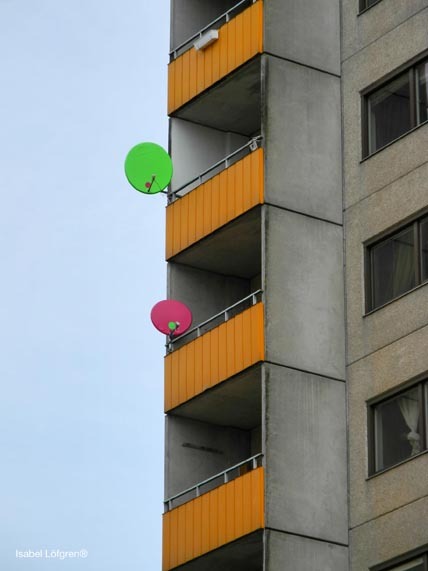 Satellitstaden is a public arts project and artistic research project in Fittja that uses the satellite dishes that hang from virtually every balcony as the central element of artistic intervention. The purpose of the satellite dish in the installation is three-fold. Formally, the satellite dishes become a surface for artistic intervention in public space fully integrated into its architecture and urban fabric. Socially, they become a relational object around which an interaction with local residents (and also between residents) can take place. From a communications standpoint, I am interested in how the satellite dish, and the television signal it receives, affects everyday life in the context of the local society. These aspects are expressed through the various dimensions of the project: the onsite installation with the colored dishes, an online interactive map showing the social networks that emerge from the dynamics of the onsite installation, and a research paper/case study that will emerge from this experience that culminates in the project’s catalogue. All of these aspects have been worked on concurrently on site. 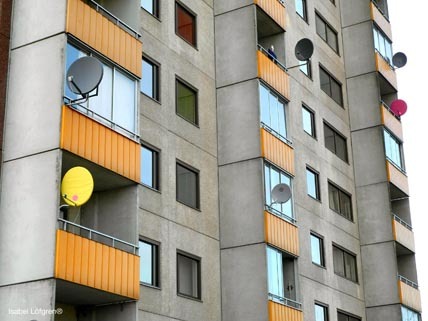 According to preliminary research, satellite dishes hanging from people’s balconies in suburbs like Fittja represent far more than what the eye can see. First, they violate building codes. Some construction companies forbid them outright - they pose security risks when poorly installed and override previous collective arrangements with cable TV companies. Secondly, they are considered an eyesore. Many people think it clutters the façades and undermines the architectural value of the buildings, and of the general landscape. 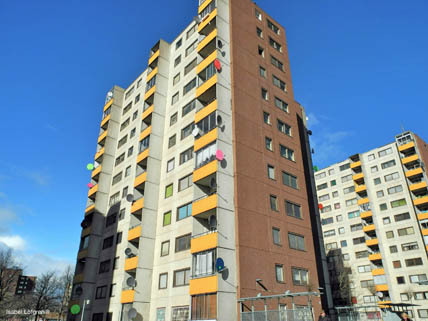 Lastly, satellite dishes in immigrant areas such as Fittja are considered a symbol of a segregated society and the failure of social integration policies in the context of immigration. My motivation for this project is the observation of a growing anti-immigrant sentiment in many European societies. 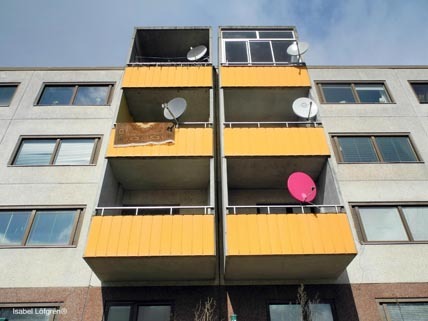 I was curious about the real motives behind the prohibition of the satellite dish in areas similar to Fittja and its status as a symbol for social segregation. Knowing that Fittja is one of the most diverse suburban areas in Sweden, I was puzzled by a lack of public expression of all these cultures in public space - a heterogeneous micro-society living behind homogeneous, sterilizing, and visually oppressive façades. I was also keen about learning more about the significance of satellite television in the lives of immigrants and understanding the role of transnational communication networks and its effects on cultural integration. However, one can only reach a satellite dish in Fittja with the consent of its owner. Therefore, Satellitstaden relies exclusively on the participation of local residents. For this purpose alone, living on site at Residence Botkyrka with exclusive dedication to the project, makes it possible to find participants and fully deploy the project. The importance of my own social immersion in the area is seen as a key factor for its success - it only works if I fully “inhabit” the installation site. Proximity to the project’s production studio in Fittja is crucial to ensure speed of delivery within the time frame. Being in residence in the area definitely strengthens the project’s anchoring in the local society and creates a great base for the project's operations.